Our friends over at Calvium invited us to create an experimental installation for their Ideascape public showcase at Porth Teigr, Cardiff – so we challenged ourselves to make a set of augmented reality binoculars that allow you to view the past and future of the surroundings. Back at the beginning of summer, Calvium invited us to contribute to their exciting new project. Calvium were hosting a community engagement event in Cardiff Bay; a playful sandbox event of concepts and interactive prototypes related to the new Porth Teigr development. We would be helping to investigate how augmented reality could be used to encourage people to engage with their surroundings and stimulate their imaginations – contributing to Calvium’s research into digital placemaking. My close relationship with Calvium goes back quite a few years – I worked on interface design and user experience for many of their heritage apps. We previously investigated ideas of overlaying historical maps and photos onto modern day views in Hidden Florence, a placemaking app designed for the Renaissance city. And when it comes to visitor engagement, we had great success exciting adults and children alike with the Tower Bridge Family Visitor Trail, which has interactive games that use a very physical element as well as accompanying printed material. We already knew we wanted to play to our strength of creating dynamic, visual experiences, and come up with something that simply allows people to visualise the past and future – literally. After some discussion and a couple of site visits to Cardiff Bay, our idea settled into the form of augmented reality binoculars, with a physical lever to transport the viewer through time. We took our inspiration from the metallic coin operated binoculars that are ubiquitous at many seasides and landmarks around the world – perfect for inviting anyone and everyone to experience cutting-edge technology without needing so much as a smartphone themselves. We were confident that one of our well-established Cardboard VR deployments would fit nicely into the unit. 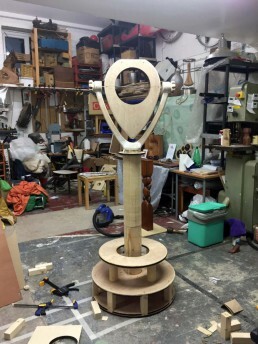 Our fabrication engineer, Luke, was also very excited to build the physical viewer – seizing the chance to really indulge in making a beautiful physical piece that sparked people’s nostalgia – and referenced Porth Teigr’s industrial past! In order to make our software work perfectly for a very specific position, we used open source DTM and DSM lidar datasets from the Welsh Government to recreate an accurate 3D model of Cardiff Bay. Combined with 16K 360 imagery we captured on site, this gave us a real-world foundation on which to build the augmented world view. From there on, we used some awesome reference material – including historical photographs, maps and concept art of future building developments – to help us figure out where (and when!) to position various augmented buildings, ships, trains and other objects. The end result of all this effort is that you’ll see an old steam ship in a dry dock, exactly where it would have actually been 100 years ago. You can even watch an old coal train rumble past, following a railway line traced from a 1930s map. After conducting various tests with Apple’s ARKit, we decided to use it for this project. The reason for that might not be obvious, considering the built unit could just use a gyroscope to control rotation. However, we wanted to see if ARKit could be used to ‘calibrate’ our digital twin of Cardiff Bay – effectively allow the augmented reality objects to realign themselves correctly, according to where the viewer is positioned. And if you walk for 5 minutes across the bay, and look back at the old dry dock next to the Gloworks building, the big ol’ 1900’s steamer will still be securely docked, This clearly has huge potential for portable, user-device placemaking and trail apps. Towards the end of the project, Google unveiled their answer to ARKit: The similarly named ARCore. With the chance to make use of a much greater screen resolution, we immediately jumped ship and converted the project to Android, settling on a Samsung S8 smartphone as the device of choice. The augmented reality binoculars were featured as a central part of Calvium’s Ideascape evening. After a few teething problems with the physical unit, we had to swap the time-travelling lever with a flathead screwdriver. Nevertheless, that seemed to add to the charm, with many visitors being quick to make the connection between our handy time-travelling screwdriver and a certain Doctor Who Experience barely 100ft away! The AR binoculars went down extremely well with local residents and out-of-town visitors alike. That included city planners and architects, who were thinking about how they could use such a device for the visualisation of building developments and heritage applications. However, we were most excited by the reactions of local residents. Not necessarily tech-savvy, and not particularly accustomed to time travel; most people fully understood how to use the unit – presumably from cultural familiarity with the idea of coin-operated binoculars. But most strikingly, most residents wasted no time spinning around to view Porth Teigr’s future building developments – inspecting the height of the buildings, seeing how far they will stretch down the bay, and speculating about coffee shops and pedestrian access. Various couples shared the binoculars and started their own conversations about the residential development – without a word about smartphone screens or ARCore. The technology we had created had become invisible, allowing anyone to peer through to the future in a way they already understand. We can’t wait to see where these ideas will go next – a city-wide 3D heritage trail? 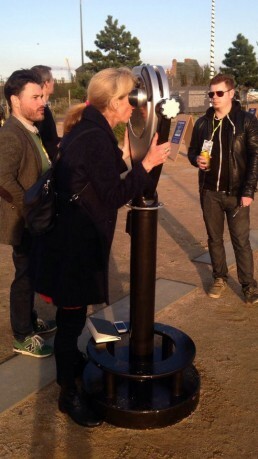 Permanently installed Augmented Binoculars on the streets of Bristol? A super-engaging and accessible form of community engagement for city planners and developers? There are a few ideas in the pipeline, and who knows, you might get to peer through these binoculars sooner than you think!